Using a Bible study guide is an excellent way to lead a small Bible study group and keep group members focused on the topic at hand. The Bible speaks to just about every topic imaginable, even health and nutrition. You can use the guide below for a Bible study group focused on healthy eating. Start your group discussion with an opening prayer and then lead into a discussion of how physical health, nutrition, and spiritual health are connected. Lord, thank you for bringing us together to meet today in your presence. Please allow us to learn and grow in your word during this discussion today. Help us to understand the importance of keeping our bodies healthy -- both physically and spiritually. In Jesus' name, Amen. Next, discuss the spiritual steps that can guide someone to healthy eating. You can use Bible verses to support the discussion. Quotes that follow come from the King James version. The following Bible verses may be helpful to illustrate this principle. (John 6:35) And Jesus said unto them, I am the bread of life: he that come to me shall never hunger; and he that believe on me shall never thirst. (Matthew 4:4) But he answered and said, it is written, man shall not live by bread alone, but by every word that proceed out of the mouth of God. (1 Corinthians 6:19-20) What? Know ye not that your body is the temple of the Holy Ghost [which is] in you, which ye have of God, and ye are not your own? For ye are bought with a price: therefore glorify God in your body, and in your spirit, which are God's. Use the following verse from Proverbs. (Proverbs 23:21) For the drunkard and the glutton shall come to poverty: and drowsiness shall clothe a man with rags. Biblical text outlines food choices, suggesting you choose lean meat, fruits, vegetables, nuts, oils, whole grains, and legumes. (Acts 27:34) Wherefore I pray you to take some meat: for this is for your health: for there shall not a hair fall from the head of any of you. (Psalms 104:15) And wine [that] make glad the heart of man, [and] oil to make [his] face to shine, and bread [which] strengthen man's heart. (Ezekiel 4:9) Take thou also unto thee wheat, and barley, and beans, and lentils, and millet, and fitches, and put them in one vessel, and make thee bread thereof, [according] to the number of the days that thou shalt lie upon thy side, three hundred and ninety days shalt thou eat thereof. 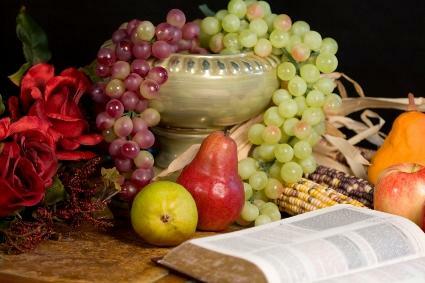 (Genesis 9:3) Every moving thing that lives shall be meat for you; even as the green herb have I given you all things. Use the following questions to guide a group discussion. Why is it important to eat right, take care of your body, and stay healthy in the eyes of God? Why do you think gluttony can negatively impact your life? Have you experienced negative effects from overeating, being overweight, or putting the importance of food before God? Have you ever turned to food over God to cope with stress, sadness, hurt, or anger? What happened as a result? How can you use your faith to influence healthy eating habits? Ask participants to write at least one lifestyle (or eating habit) change they'd like to make to improve their health. Suggest they make time to talk with God daily and ask Him for strength to overcome obstacles that prevent them from meeting their goals. Lord, thank you for bringing us together today to study your word and the importance of being healthy, eating right, and turning to you to meet all of our daily needs. Please allow us to make changes, if necessary, in eating habits to nourish our bodies properly -- and be healthy, happy, and free from illness and disease. Please help us use your word to guide our lifestyle choices. In Jesus' name, Amen. Leading a Bible study is simple when you have the right tools at hand, including an easy-to-follow study guide. Faith, health, and nutrition go hand in hand -- and healthy eating is just one of many important topics found in the Bible.